It’s officially fall! The leaves are beginning to turn, I’ve dusted off my boots from the closet, PSL’s are starting to roll out everywhere, and (most importantly) fall baking season has arrived. There are so many apple pies, pear tarts, and pumpkin everything in the near future. You know, goodies to snuggle up with under a cozy blanket after a long day spent apple picking or just watching football. Who’s excited? Despite the rain, fall is definitely my favorite season, and I am thankful for living in a city where you literally watch the seasons change before your eyes. The vibrant, firey-colored leaves, the chunky scarves and knits, the crisp mornings – what’s there not to love? The colder climates call us back into the kitchen, making us actually want to turn on the oven after such a warm summer. It’s time for baking – utilizing this season’s finest produce and warming spices, so let’s get to it! 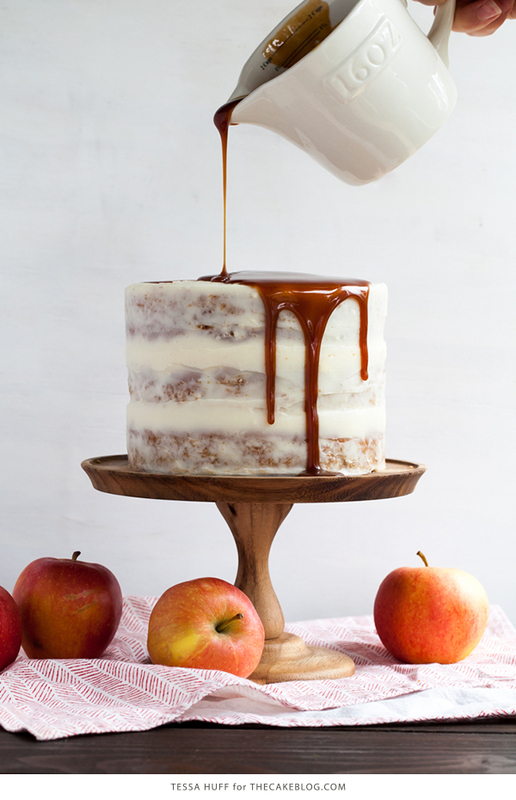 Before we dive head-first into warm, ooey gooey fall treats, let’s consider this light and fresh apple cake. 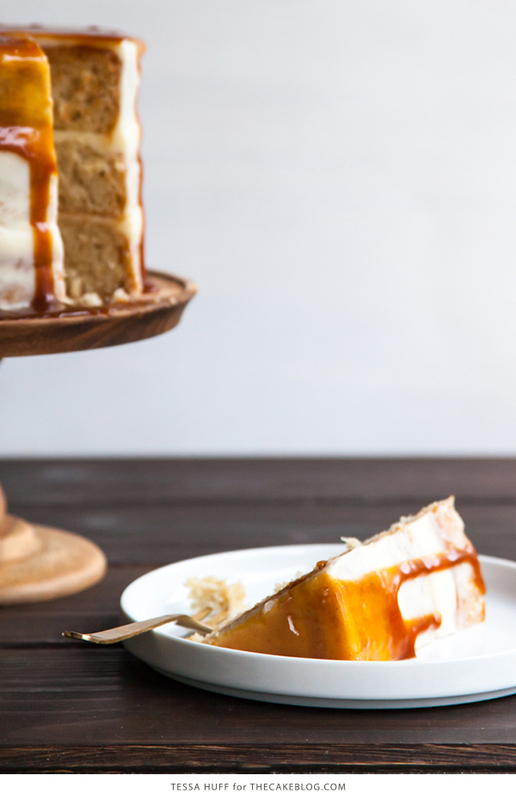 Unlike most other caramel-covered apple treats, this cake is made with sour cream and a dash of cardamon. It is then brightened up with a creamy goat cheese frosting. Goat cheese, you ask? Think of it as a refreshing alternative to cream cheese in a tangy, mouth-watering frosting. It is seriously good stuff. To top it all off, cinnamon-infused caramel is drizzled and dripped over the top, because you know – it is fall after all. And if you are into salted caramel sauce (and let’s face it, who isn’t? ), sprinkle with flakey sea salt for an extra punch! Preheat oven to 350 degrees. Grease and flour three 6-inch round pans and set aside. Mix together the oil and sugars with an electric mixer. With the mixer on low, add in the dry ingredients in two batches. Evenly distribute between the prepared pans and bake for 20-24 minutes or until a toothpick inserted in the center of the cakes comes out clean. Note: The batter will be quite thick, so be sure to smooth it out once in the cake pans. Beat the butter with an electric mixer until smooth. Add in the goat cheese and mix until combined. With the mixer on low, gradually add in the remaining ingredients. Adjust the amount of sugar until desired consistency and sweetness is reached. Slowly bring the cream to a simmer over medium heat. Add in the cinnamon stick and remove from the heat. Transfer the cinnamon stick, cream, and ground cinnamon to a heat-safe container. Cover and steep in the fridge for about 30 minutes. After the cream has steeped, discard the cinnamon stick and resume making the caramel. 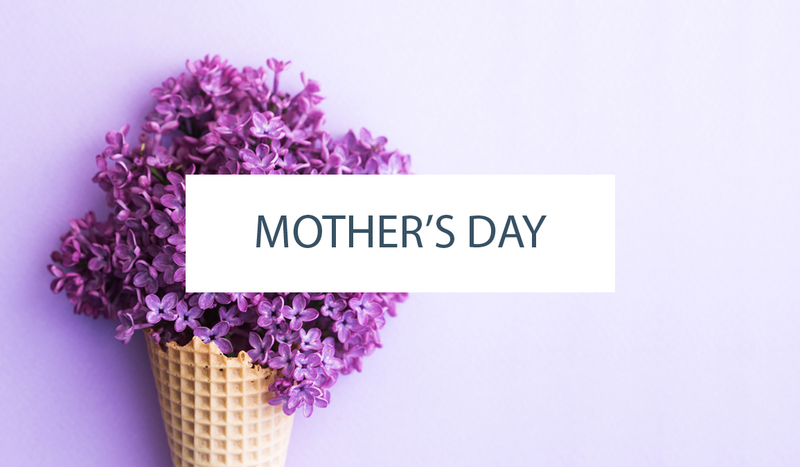 Place the sugar, water, and corn syrup in a medium saucepan. Bring to a boil over high heat. Continue to cook the sugar (without stirring) until it reaches a medium amber color. Remove from the heat and carefully whisk in the cinnamon-infused cream. Stir in the butter until combined. Transfer to a heat-safe container until it cools to your desired thickness. Note: leftover caramel may be kept in the fridge for about 2 weeks. Once the cakes have cooled, trim and level, if necessary. Spread on about 1/3-1/2 cup of the frosting between the layers. Use the remaining frosting to give the outside a rustic finish. Once the caramel has cooled, drizzle it over the top of the cake and sprinkle with flakey sea salt, if desired. This cake will be residing in my dreams. It’s gorgeous! This looks so insanely good! I love the idea of using goat cheese in the frosting instead of the more typical cream cheese. Can’t wait to try this! This cake is absolutely gorgeous looking! I made it for our thanksgiving dinner tonight and it was to die for. Definitely going to be one I make again and again. this cake looks so gorgeous. it looks so good with the caramel going down it! Cake is looking so tempting that i want to have one bite of it. You used goat cheese. I have not used it yet. But i have an idea now. Thanks..
where did you get this lovely cake stand? Tessa purchased this cake stand from Anthropologie. 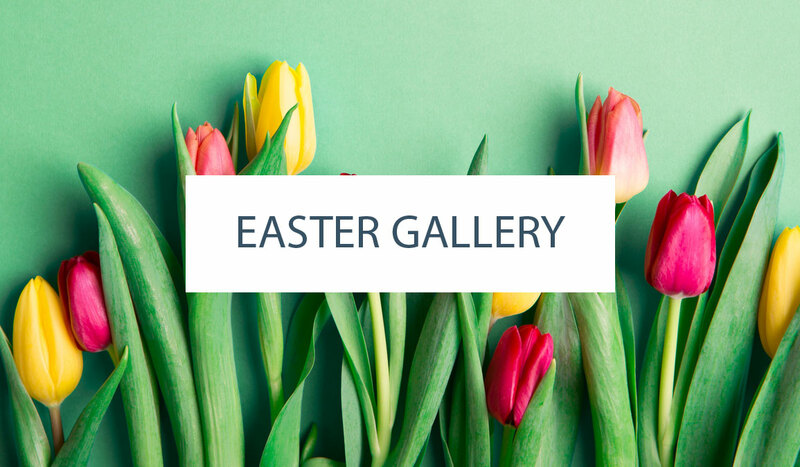 Unfortunately, it is no longer on their website. I saw some in my local store last fall – perhaps it is still available in your local store. Fingers crossed! What would be the best type of apples for this? Whatever apples you enjoy eating! Just use a mixture of tart and sweet to keep the flavors balanced. Like pairing Granny Smith with Gala. Yumm! Such a beautiful cake! Love it! K I’m trying this now!! Thanks for the beautiful recipe and photos!! What a unique type of cheese to add to a cheesecake!! I love the different style of this, its absolutely beautiful! 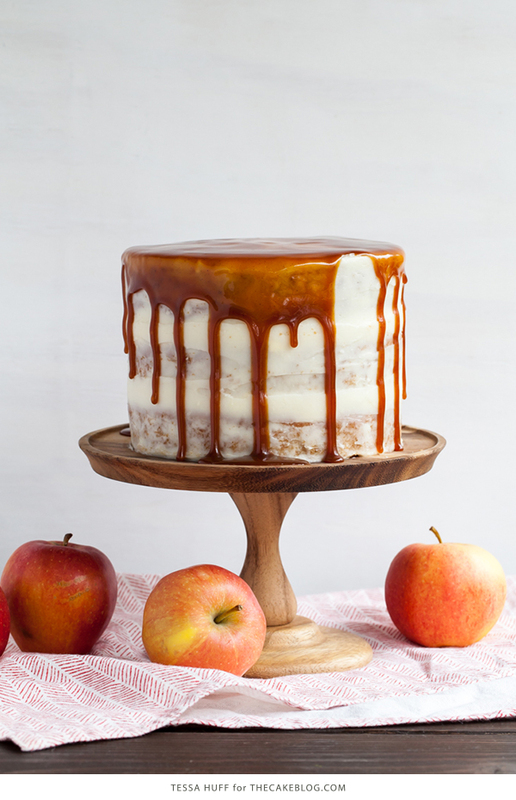 I am hosting an Apple Tasting fundraiser for Habitat for Humanity and this cake would be the perfect addition to the dessert table. Could I bake the cake and freeze it prior to frosting it? 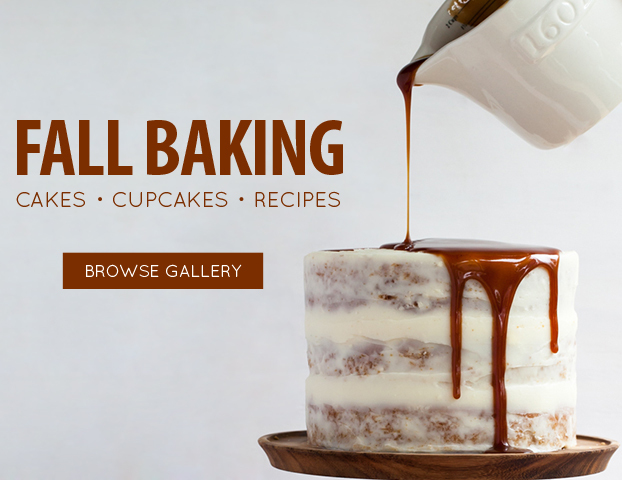 Sure, you could certainly bake the cake in advance and freeze it. Just wrap the individual cake layers in plastic wrap to protect them. Let them thaw before assembling and frosting. Best of luck on your fundraiser! Looks delicious! 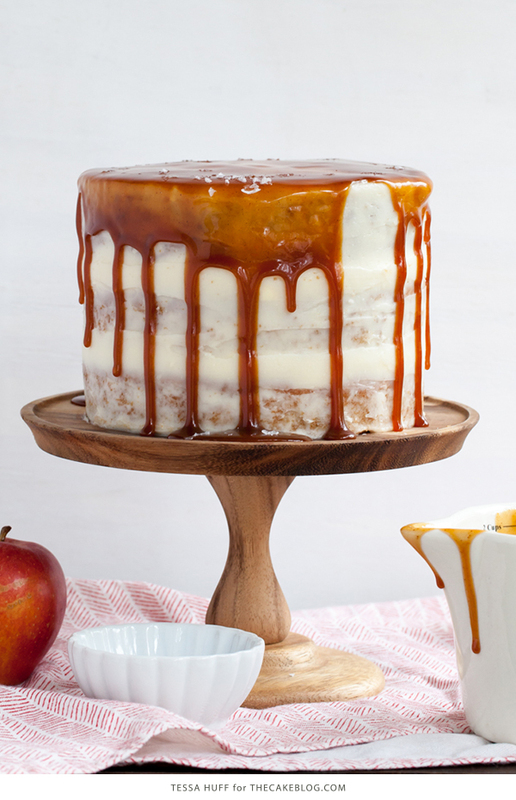 Will the caramel drizzle harden and stay like I see in the picture, or will be run off the cake? I’m wondering if I should add the drizzle the day before or wait till it’s serving time for the full effect. Adding the drizzle ahead of time is fine. 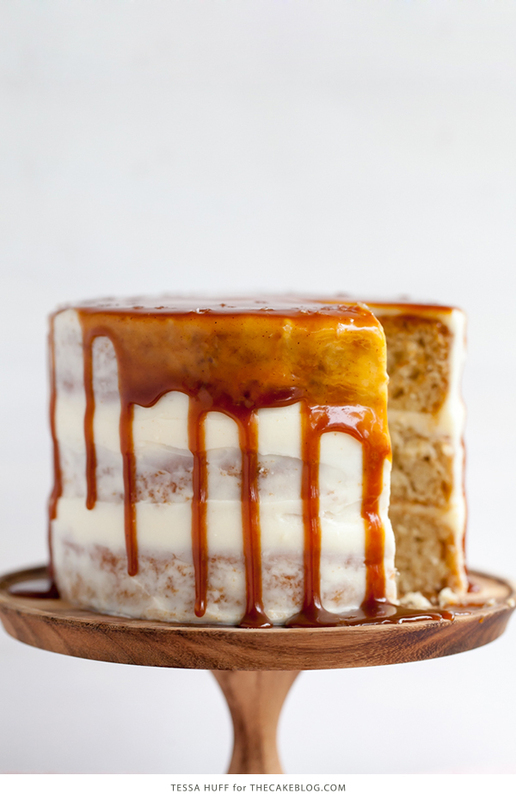 You want your caramel to be cool but still pourable when creating the drizzle. As long as you don’t go too heavy or too hot on the pour, you’ll have nice drips that set up on the sides and will stay put. 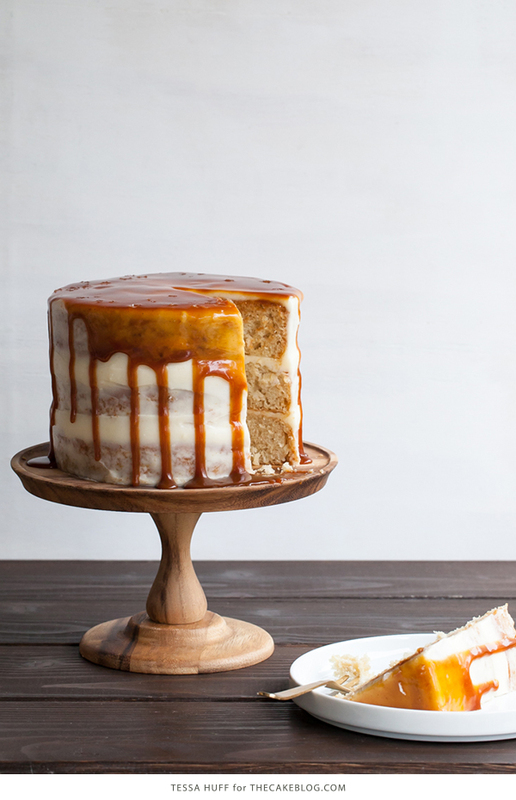 If your caramel is too hot or you pour too much, you’ll have some pools of caramel around the base of the cake. It will still be delicious though! This looks gorgeous and I can’t wait to try it! I would like to use an 8 inch pan, is this recipe enough for 1 or 2 layers? I just made this cake for a family gathering and it was divine! I thought the goat cheese would be very dominating but it was a perfect complement. I will definitely make again. Thank you! Disappointing, I tried this twice, the second time I cut my apples smaller and sifted in my flour. Both times my cakes came out like pancakes (no rise). I’ve been baking for over 40 years. Not the first time I’ve run into issues with an independent baker leaving something out. On a brighter note the icing and Carmel sauce were awesome!